Brenda Schmidt is a writer, visual artist, naturalist and active blogger based in Creighton, a mining town on the Canadian Shield in northern Saskatchewan, and she has lived in northern Saskatchewan for twenty-six years. Schmidt was a finalist for the Saskatchewan Book Award for Poetry in 2001, is the winner of the Alfred G. Bailey Prize for Poetry in 2003 and a finalist for the CBC Literary Award for poetry on four occasions. 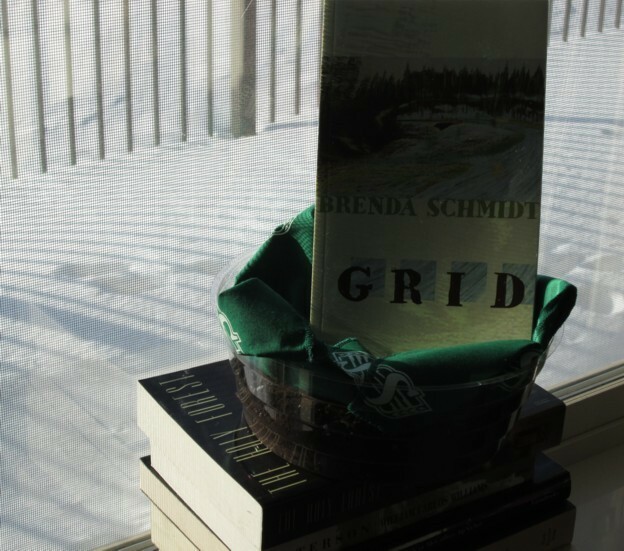 In her fourth collection Grid, Schmidt’s wry humour transcends what we have watched heap up in Canada for more than a century—nature poems—balancing in canola fields between the beautiful lure of nature and our curious urge to separate ourselves from disappearing allotments of our own solace. We have wandered “off the grid” but fortunately Schmidt is an entertaining and insightful guide who can still find Li Po in a Dark-eyed Junco, if she has to. at a spa in Regina. Fine.